The 10th edition of the Schedule Spot Fade Plays weekly article is ready to go. It was a second straight bad week for the schedule spot fade plays last week. After an 0-3 week, the plays went just 1-4 last week. TCU cashed in easily as a four-point underdog in their win over Oklahoma State, but that was the only bright spot. Belmont won the game but couldn't cover the number. Baylor was upset on their home court and didn't come close to covering the number. Denver got the game into overtime but lost it in the extra session. Drake wasn't as big of an underdog as I figured they would be, but it wouldn't have mattered anyway as the Bulldogs were blown out by Indiana State. Doc's Sports will be testing out an experiment this year on difficult/strange scheduling spot plays in college basketball. We wanted to put together a weekly article to track teams who are in difficult spots and see if fading those teams can be profitable. How will it work? We'll point out teams that are in odd spots and then suggest a 1-Unit play on that team using Doc's Sports Unit Betting System. Since the lines are not available until the night before the game, we'll simply be recommending a play and then grading that play based on the opening line from Bookmaker. Each week we'll go back and look at the prior week's results and keep a running tally at the end of each article. 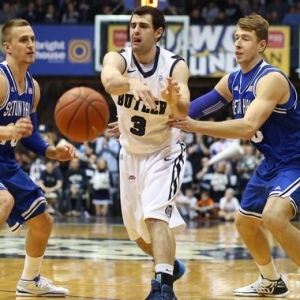 This article is simply a test, and we hope it will be helpful to college basketball bettors. We haven't been finding the right spots in the past couple weeks. We'll try to get things headed back in the right direction this week. The Delaware Blue Hens are coming off a stunning outright win as a 13-point underdog against William & Mary. William & Mary has long been considered the best team in the Colonial Athletic Association, but Delaware has beaten them twice this year. This Delaware team has been among the most inconsistent teams in the nation, and their win at William & Mary should give us extra value on UNC Wilmington here. Wilmington is coming off a nice win over Northeastern. Delaware has won two games in a row only once this year. Last time Delaware beat William & Mary, they lost their next game against Elon (a bottom-tier team in the CAA). I think there's a good chance Delaware fails to cover this number based on their inability to string together good performances. The schedule-makers in the Big West didn't make it easy on Cal State Fullerton during this period. Fullerton has played two overtime games in their last five contests, and they had a brutal schedule last week. Fullerton went to UC Davis (the top team in the Big West) and lost. They then made the long trip to Hawaii and lost by 20 points on Saturday night. That trip to Hawaii is really tough, and I think the fatigue factor makes this a tough spot. Cal Poly has shown they can win on the road this year. The Mustangs strong defense and Fullerton's tired legs should lead to a valuable spot to back Cal Poly. Montana is coming off a huge triple-overtime win on Saturday night in Northern Colorado. Montana is clearly one of the better teams in the Big Sky Conference, but this isn't a Montana team that is terribly impressive on offense. Montana will be favored by a big number in this one. The Grizzlies are in a letdown spot here as they play against one of the bottom feeders in the conference following an impressive road win. Why would Montana get excited about this game? Backing Idaho State isn't easy to do, but it's a nice spot to fade the Grizzlies and take the underdog and the points. Nebraska put a lot into their home loss against Wisconsin last Tuesday. They looked like a tired team on Sunday in their loss at Purdue. Tim Miles' team has been awful on the road in Big Ten play. Maryland is coming off a momentum-building road win at Penn State. The Terrapins will certainly be favored here, but they aren't likely to be laying a big number. Nebraska isn't a deep team, and their stars have been playing big minutes. The Cornhuskers appear to be wearing down, while Maryland is hitting their stride. The Xavier Musketeers have been one of the most inconsistent teams in the nation this year. This Xavier team has looked like a team that could make a deep run at times. In other games they look like a team that has no business being in the NCAA Tournament. Xavier has a massive rivalry game with the Cincinnati Bearcats on Saturday. That's a game that will take a lot out of both teams because of the physicality of the game. Butler plays Monday night and then gets to rest up and prepare for this Saturday contest. Xavier has home losses to Creighton and St. John's in the last two weeks. I'll fade the Musketeers coming off a big rivalry game. Best Betting Teams in College Basketball: Time to Buy or Sell?